Is it possible to live completely waste free for a year? 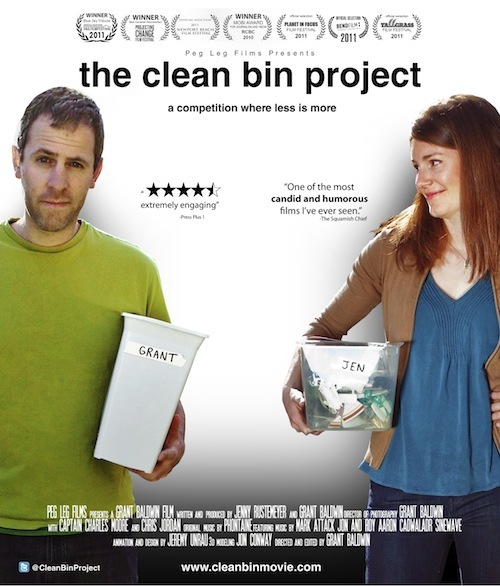 In this award-winning documentary, partners Jen and Grant go head to head in a light-hearted competition to see who can swear off consumerism and produce the least garbage. Set in Vancouver, this film is a call to action that speaks to crowds of all ages. Before the film in the theatre foyer there will be a chance to visit the Free Store Table (bring a functional item you no longer need….maybe a Christmas gift that didn’t quite resonate with you…….. and take away something that you do; see below for guidelines) and the Transition Sooke table where there will be a small display of items that can replace some of the plastic in our lives such as reusable produce bags, can and bowl toppers, and cleaning sponges. Once in the theatre, the evening will start with a short video tour (done by Jen and Grant) of the Gibsons Recycling Depot and a talk by Buddy Boyd, from Zero Waste Canada and co-founder of the Gibsons depot. After the screening of “The Clean Bin Project”, there will be a discussion led by Transition Sooke’s Tony St. Pierre focusing on ideas for reducing the garbage footprint in the Sooke and Juan de Fuca Districts attended by Sooke Mayor Maja Tait and several owners of local businesses who have taken steps to reduce their garbage footprint. We will learn about Transition Sooke’s initiatives to reduce the use of plastic bags and will be launching a Zero Waste Committee to hopefully work with our elected and appointed officials on making our local garbage disposal areas less of a “dump” and more recycle and re-use friendly. 1. Items should be cleaned prior. 2. Items should be useful/functional and/or art rather than knick knacks. 3. A max of 3 items for the table; unlimited takeaway. 4. No clothing unless it is a special item (handmade, vintage, brand new, etc.). 5. If you have items too large to be carried away, bring a photo and/or description and contact info for the table.